Chops are one of the lamb cut that have its own unique taste. In this recipe Pickle spices enhance the juicy lamb chops and create a superb taste. 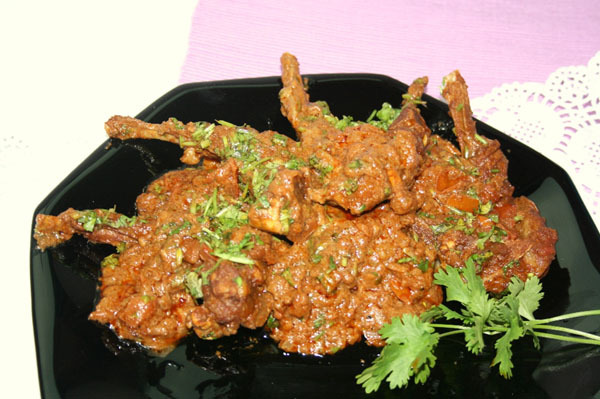 Chops are cooked in a clay pot that is way this is called Handi Achaari Chops. Serve it with roti, naan or paratha and mint raita. Add this recipe in your lamb recipes so you don’t forget and enjoy with family. Coarsely crushed together anise seeds, cumin seeds, coriander seeds, onion seeds and fenugreek seeds. Heat oil and fry onion for 5 minutes, add ginger garlic paste, tomatoes, salt, chili powder and turmeric, fry well, add in chops with 2 glasses water, cover and cook till chops nearly done. Add in all the coarsely crushed seeds, kasori methi with lemon juice and green chilies, leave it on dum till oil comes on top.